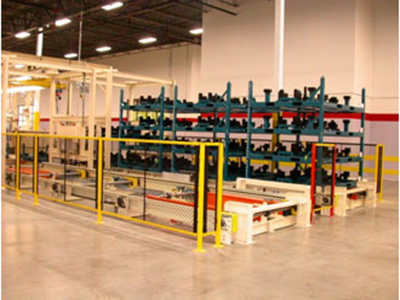 ASI Rack and Pallet Handling Systems provide a cost-effective way to efficiently manage shipping racks along plant assembly lines, decreasing fork truck handling and traffic by reducing the number of exchanges required and eliminates the risk of impact with operators and equipment. 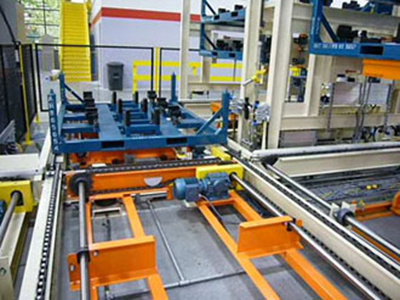 Provides a “safe” environment for the load operator and eliminates production delays. 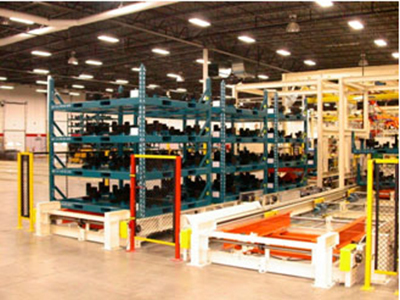 Reduces excessive fork truck traffic along the assembly line for rack exchanges. Saves valuable floor space and makes efficient use of the fork truck operator’s time, freeing the operator to perform additional tasks. 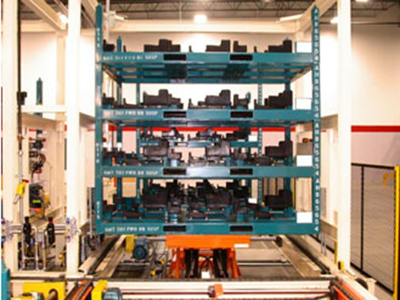 Unsafe fork truck stacking of multiple racks is eliminated and provides for “safe” machine automated de-stack and stacking of racks. Spec 1 – Designed to meet the assembly system rate of 1 part every 45 seconds. Spec 2 – Provides for a rack exchange in less than 28 seconds. Spec 3 – Rack height at the part load position is at 24. providing a good ergonomic range for the operators and load manipulator. Stacks of empty racks are loaded by fork truck at position #1. The racks move forward and accumulate prior to the rack de-stacker at position #4. A Hydraulic Lift Table raises the stack of racks allowing cylinder operated dogs to swing in and support the upper racks, permitting the bottom rack to convey out to the #5 Cross Transfer position. 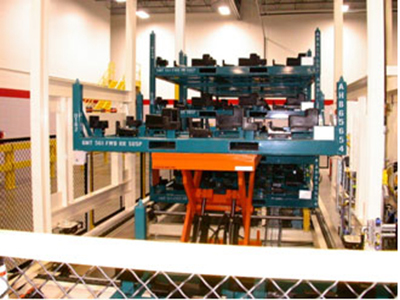 The single rack then conveys across to position #6 via (2) Pop-up Lift Cross Transfer Conveyors. The empty rack proceeds to position #7 for operator load of product. 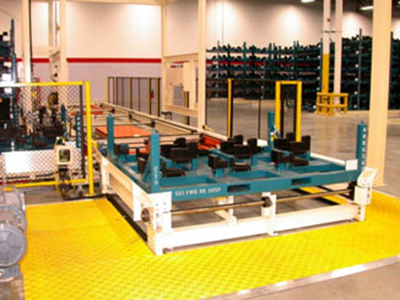 Safety mats are interlocked with the conveyor to prevent rack movement during part load and protect the operator. The loaded rack proceeds to position #8 for stacking of full racks. Simultaneously, an empty rack from position #5 moves to position #7. Total rack exchange time is less than 28 seconds. The stacked racks convey and accumulate in positions #9, #10 and #11. A fork truck unloads the stacked racks at position #11. The load and unload conveyor positions have pop-up lift platforms which eliminate fork truck impact with the chain conveyors.